Choosing a new exterior paint color can be a stressful situation for many homeowners. Will your chosen color look as good in the morning light as it does in the afternoon? Will you like the color for many years, or will you tire of it too soon? What will your neighbors think? With these questions stirring in your mind, the task at hand can seem quite intimidating, but committing to new exterior paint isn’t as complicated as you may think. Before professional painters start on your exterior painting project, follow these helpful tips for choosing the best paint colors for your house. One of the very first things you should do before choosing exterior paint for your home is to take a good scan of your neighbors’ homes. Is there a common color scheme going on in your neighborhood? Maybe you belong to a homeowners association (HOA) that has strict exterior paint color guidelines, or even live in a home that must adhere to historical bylaws. Either way, you will want to select hues that match and blend well with what’s going on in your neighborhood instead of sticking out like a sore thumb. This isn’t to say you should go with a dull color! Neutral paint colors can look incredible when painted by professionals. If you want to add some pizazz to neutral colors, think about adding a complementary hue to your exterior wood trim and other interesting architectural details to make them stand out. Exterior Paint Color Tip! Never paint your home the same color as the houses located right next door. 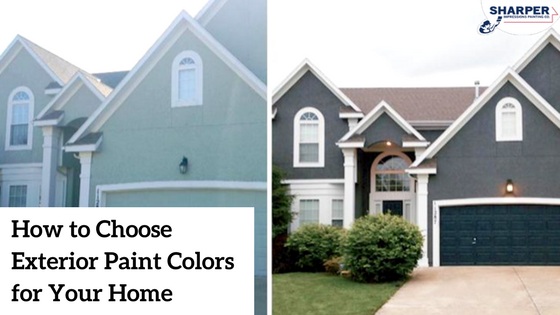 Give your house and neighborhood some more character by choosing a complementary paint color instead. One often-overlooked element of exterior painting is a home’s landscape. Do a lot of trees surround your home? Consider the change of seasons and the different colors the leaves change to. What color are the flowers and plants that adorn your porch, flowerbeds, and flower boxes? Does your home get a lot of sunshine, or does it tend to get more shade? Your natural surroundings can provide substantial clues as to which exterior paint color will look perfect on your house. While that bright, yellow paint may suit your vibrant personality, going bold may not be your best bet for your home’s resale value. If you’re thinking you may sell your home in the not-so-distant future, you should consider choosing a neutral or traditional exterior paint color that will attract a lot of buyers. Colors like off-white, blue-gray, gray-green, forest green, warm taupe, and even pale yellow can attract a host of people who are out there house hunting. On the flip side, if you’re simply updating your exterior paint because it needs a color refresh, you will want to choose colors that you love and match your personal style. If this sounds like you, consider painting doors and window trim in more vibrant colors, and stick to more muted hues for your siding. You should also think about the colors on your house that won’t be changing. Stone accents, brick, slate, and your shingles all must be taken into consideration when choosing exterior paint colors. Getting a close look at the various color combinations found on these building materials will help you choose a complementary hue for your siding and trim. Head to your local paint store with your signed contract and you will receive two free color try-on cans of paint along with two foam brushes to paint a small area of your home exterior. You can even get the paint colors delivered right to your door! Once the paint has dried, you can make a more informed decision. Have large color swatches mailed to you and tape them to the side of your house to help you decide on the hues you like best. Get a digital, printable image of your home that includes your desired paint color choices. Simply take a picture of your home, email it, and in about a week, you will receive a photoshopped picture of what your house will look like with the new colors. When in doubt, ask an expert! When you hire exterior painters for your home, you can schedule a free paint color consultation with a professional color consultant. Whether you have gone through all of the steps above and are still lost, or just need extra assistance on deciding between a few different shades, a color consultant can help you decide on the best exterior paint color to match your home’s neighborhood, landscaping, architectural features, and lighting. A fresh exterior paint color is a simple, cost-effective approach to revamping the appearance of your home. Just a few minor color updates to your siding and exterior trim can make your home look fresh, new, and inviting. Whether you are planning to sell your home, or live in it for a lifetime, hiring professional painters for your exterior painting project will ensure that your home looks great and reflects your end-goal. Get your free exterior painting quote today.